The target means that by 2030 around a third of new cars in Europe will be electric or hydrogen-powered, lobbying group Transport & Environment said. 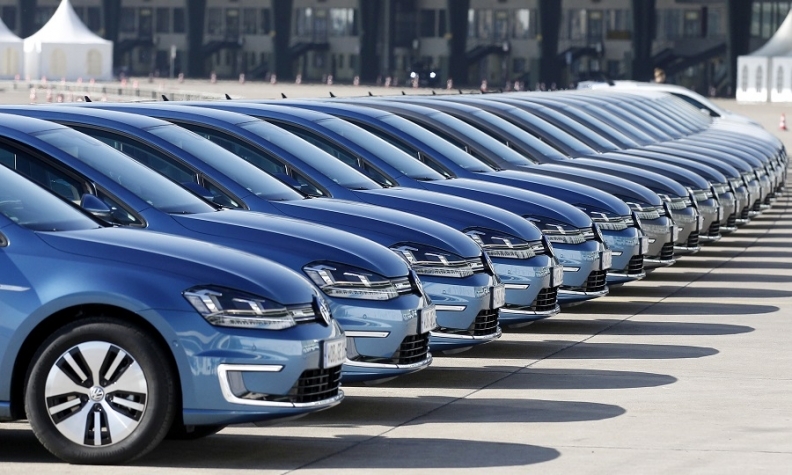 Pictured are electric Volkswagen Golf models. BRUSSELS -- Auto industry groups warned that a European Union goal to cut CO2 emissions from cars by 37.5 percent and from vans by 31 percent by 2030 compared to 2021 levels would threaten automotive jobs and consumer choice. Representatives of EU governments and the European Parliament agreed to the reduction on Monday, finally settling differences between vehicle-producing countries and environmentally-conscious lawmakers. EU negotiators also fixed an interim CO2-cut target for cars and vans of 15 percent by 2025. The 28-nation bloc has been divided for months over how strict to be on CO2 emissions from vehicles as part of its push to reduce greenhouse gases. Germany, with the EU's biggest auto sector worth some 423 billion euros ($480 billion) in 2017, had warned that tough targets and the drive towards more electric cars could harm its industry and cost jobs. The negotiated deal "demands too much," said VDA head Bernhard Mattes. "Nobody knows today how the agreed limits can be achieved in the given time," he said. ACEA, the European auto industry's lobby group, expressed "serious concerns" about the 2030 target because delivering a 37.5 percent CO2 reduction "might sound plausible but is totally unrealistic based on where we stand." The compromise was tougher than the original EU executive proposal of an emissions decline of 30 percent compared to 2021. Germany had endorsed that, but a push by several EU countries, including the Netherlands and France, raised the target to 35 percent. The EU Parliament had wanted 40 percent, so in the end, they split the difference. The EU's current average caps on CO2 from cars are 130 grams per km set for 2015 and 95g/km fixed for 2021. Brussels-based green lobbying group Transport & Environment expressed disappointment the deal was not even more ambitious. "Europe is shifting up a gear in the race to produce zero emission cars. The new law means by 2030 around a third of new cars will be electric or hydrogen-powered," its clean vehicles director Greg Archer said. "That's progress, but it's not fast enough to hit our climate goals." The agreement still needs the approval of member-country governments and the full EU Parliament -- steps that are usually formalities. "This is an important signal in our fight against climate change," Environment Minister Elisabeth Koestinger of Austria, current holder of the EU’s rotating presidency, said in a statement after a nine-and-a-half-hour meeting that marked the third attempt in as many weeks to achieve a breakthrough. "We had tough and intense negotiations."